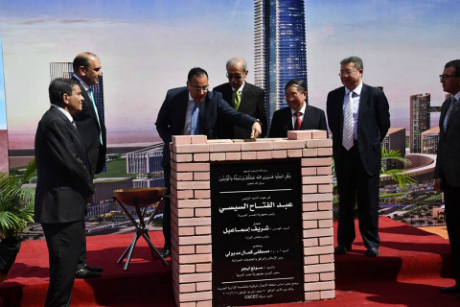 Prime Minister Sherif Ismail broke ground Sunday on the new administrative capital’s central business district, set to be built with $3 billion investments, according to a statement from the cabinet. The project, to be developed by China State Construction Engineering Company (CSEC), is set to be completed within three years, Ismail said. The business district is financed by a Chinese loan, 15% of which will be paid back by the Ministry of Housing’s New Urban Communities Authority as a downpayment, Minister of Housing Mostafa Madbouly said. The remaining 85% of the loan will have a 42-month grace period before the 10-year repayment plan begins. The new capital’s 1.71 square-meter business district consists of 20 towers for residential, commercial, and administrative purposes in addition to services. 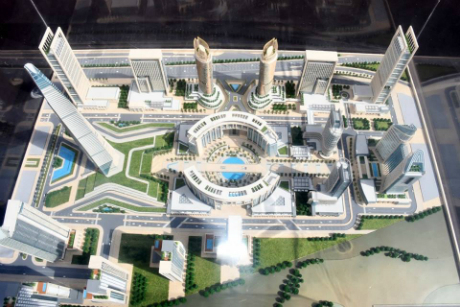 The district will also include the highest tower in Africa, at a height 385 meters, Madbouly said. “It is an honor for us to launch this project, the biggest in joint project between Egypt and China,” Madbouly said, according to a statement from the ministry. The new business district is set to draw in more foreign direct investments, Ismail said. Details of the project's design are currently being finalized, Madbouly said. The Chinese company has been granted access to the plot of land so that it may begin working on the project in cooperation with a number of Egyptian contractors. In January 2016, Egyptian President Abdel-Fattah El-Sisi witnessed in the signing of a number of projects at the new administrative capital between CSEC and the Egyptian Ministry of Housing. The Chinese ambassador to Cairo expressed his pleasure at hearing of Egypt’s achievements in the past few years, adding that that Egypt and China’s relations have improved to reach a comprehensive strategic partnership since President Abdel-Fattah El-Sisi’s visit in 2014, according to a Housing Ministry statement. Egypt and China are cooperating on a number of national projects, namely China’s the Belt and Road project and the Suez Canal Economic Zone. The CSEC built 90% of China’s skyscrapers and 50% of skyscrapers worldwide, the company’s vice president said at the ceremony.